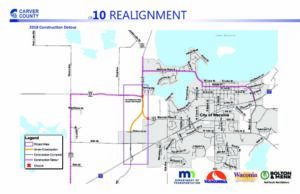 CSAH 10 from Highway 5 to Community Drive is scheduled to be closed on Monday and Tuesday August 13th & 14th. The closure will be limited to two days only (August 13th & 14th) and will prohibit access to all motorists. This closure will allow construction crews to complete roadway pavement smoothness improvements. CSAH 10 / Waconia Parkway is now closed from Pond Lane to County Road 32. This closure will remain in place until late August. This closure will allow construction crews to complete planned intersection and roadway improvements. The graphic below depicts the planned detour route during the closure. Advanced notification sighs will be placed ahead of the closure to notify the traveling public of the impending closure. 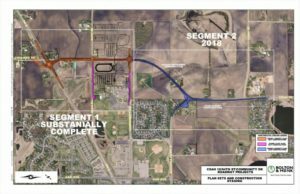 Please click an image below to see how traffic will be affected and re-routed during each phase.